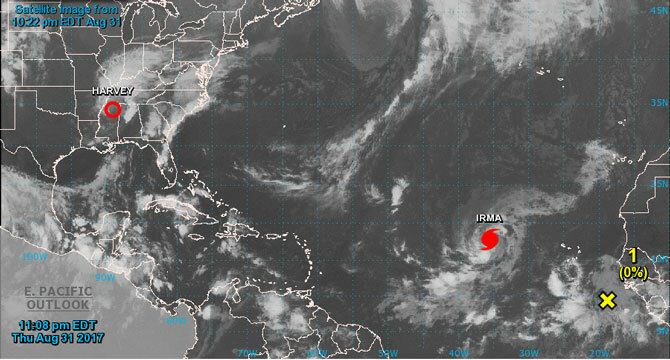 Hurricane Irma has made her threat of her visit to the Windward and Leeward Islands more prominent with increased wind speed and estimated projection. Irma, at press time a Category 2 hurricane, is projected to increase her speed and become a Category 4 by Monday. On Aug. 31, the Observer contactedBrian Dyer, director at Nevis Disaster Management Department, who said Irma is a threat to the Caribbean Islands, but it is too early to tell if the storm will have a direct impact with the islands. On Thursday, Irma had maximum sustained winds near 100 mph (155 km/h) with high gusts. Irma is forecast to become a major hurricane by tonight and is expected to be an extremely dangerous hurricane for the next several days. Hurricane-force winds extend outward up to 15 miles (30 km) from the center, and tropical storm-force winds extend outward up to 80 miles (130 km). The last hurricane that hit the federation was Category 1 Hurricane Omar in 2008. Omar impact caused the closure of the Four Seasons for two years. In 1998, Category 3 Hurricane Georges – one of the biggest storms of the last decade – directly hit Antigua and St. Kitts and Nevis, and its wide windfield affected many other islands. After weakening to a Category 2 hurricane over the Caribbean, its upper-level shear decreased, and Georges strengthened again before making landfall near Fajardo, Puerto Rico, as a 115-mph (185 km/h) hurricane. Georges’ damage in Puerto Rico alone cost an estimated US$2 billion.